Une nouvelle application de Chillingo est arrivé sur l’AppStore, Sky combat ! Vous serez en charge de plusieurs missions de combats où vos ennemis sont armées jusqu’aux dents. A vous de les détruire parmis les différents niveaux proposés et perfectionner vos armes pour y parvenir. Le jeu tir se fait en 2D avec un GamePlay très agréable. Why choose between classic gameplay and cutting edge graphics when you can have both? New missions can ONLY be unlocked only in CAMPAIGN mode, SINGLE MISSION mode doesn’t unlock missions. WATCH OUT FOR THE 1.1 update COMING SOON! Sky Combat is a beautifully crafted vertical shooter; superb water and explosion effects make this game a true visual stunner. Fight your way through the levels, facing over 30 different enemies and eight challenging bosses using three different craft: an AH-64 Apache helicopter, a speedy combat boat and an armored Humvee. Upgrade your missiles and bombs and use special power-ups – the result is some seriously action packed gameplay! The stages in Sky Combat are huge and there with eight challenging and powerful bosses to destroy, you won’t be short of entertainment. Three difficulty tiers makes for great replay value as you try to defeat the game on the hardest settings. 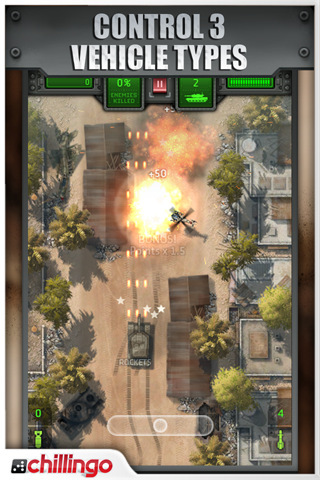 Dodge missiles, hails of bullets, tank fire and turrets on your mission to complete this tough and time-consuming game! Incredible particle effects and super detailed landscapes and vehicles ensure that this is one of the most impressive looking games in the App Store. 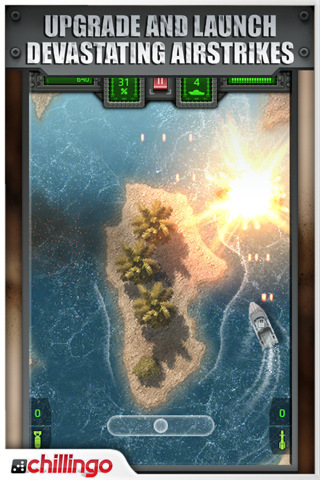 Sky Combat has water effects that have never been seen in a 2D shooter before and explosions that will blow you away! You will need to steer your craft over deep gorges and tall mountains, over rough battle scarred terrain and down meandering canals destroying everything in your path. Use the intuitive and innovative control scheme to dodge incoming fire and lay some ordinance down on your enemies. Use Touch, Relative Touch, Tilt, and Virtual joystick to maneuver around the screen, dodging incoming fire, in the vehicle of your choice. Whatever your control preference, there is a control scheme to suit. 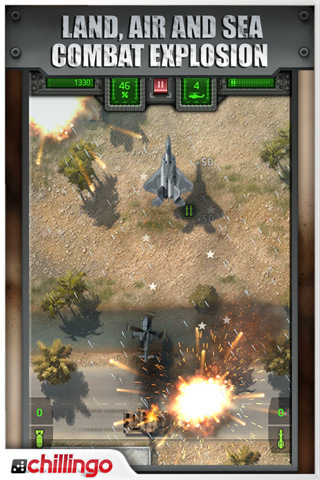 It’s not all about evasion though; fire a hail of bullets, homing missiles or drop devastating bombs on your enemies. Upgrade your weapons to cause maximum damage! Players can earn achievements and compare scores with online leaderboards through Crystal! Will you be the top gun among your friends?